At last, the super quick layers needed to complete a speedy wardrobe. 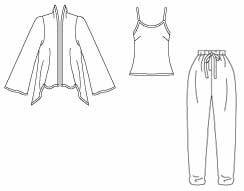 I’ve already posted about time-limited patterns for wardrobes, dresses, tops, and bottoms. Here’s the next step, some time-limited patterns for vests, jackets, and coats. A good range of styles from casual to classic. There are also some jackets in the speedy wardrobe patterns posted earlier. Interesting, these jackets suit a wide range of body shapes. Not just for rectangles, there are shaped waists for people who have them, and flared styles for the pear shaped. McCall’s 2260 has several unlined classic vests which take 1 hour of sewing time. Butterick 5888 is for similar vests in 2 hours. In the extra hour you can make a faced notched collar or an edge-to-edge lining. What about my favourite layer – tunics ? I haven’t found any timed patterns specifically for tunics. But several of the super quick dress patterns include a tunic length version, or could easily be cut to that length. Check if you need to make a larger size so it will layer comfortably over tops (see ease post). Butterick 5394 is for 2 hour knit cardigans. Butterick 5224 has more 2 hour knit styles. McCall’s 5241 1 hour knit cascade style jacket has 3 front lengths all with the same back (the only 1-hour jacket pattern I found). 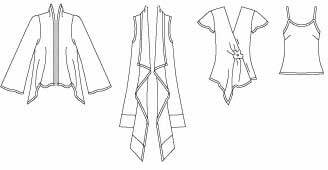 Butterick 4989 has an interesting choice of 2 hour cascade/ waterfall jackets – this time for wovens. The pattern companies also think it’s possible for us to make more formal styles in a short time. Butterick 4138 even has a classic unlined blazer pattern they say can be made in 2 hours ! There’s a choice of pocket styles and long or short sleeves. You could also round the corners of collar and hem. Or leave off the collar and use your favourite neckline (see neckline post). These two patterns show you can add some shaping even if you’re sewing quickly. 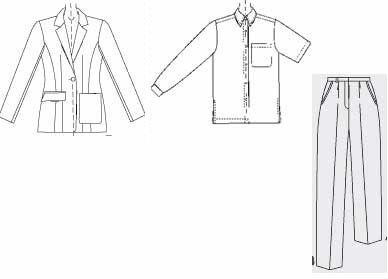 oop Butterick 5089 is a 2 hour pattern for an unlined cropped jacket with cut-on sleeves. Lengthen it for a bit more warmth, and to be more flattering for some of us. Waist length jackets (or just above it) are ‘in’ for the coming winter season. McCall’s 9576 is a ‘relaxed classic’ 2 hour reversible shawl collar jacket. 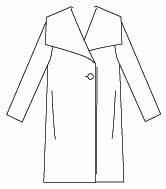 McCall’s 5988 is a 2 hour reversible coat in 2 lengths. McCall’s 3448, the easiest, is for 1 hour ponchos. And you could make a blazer along with your winter coat, right. . . I think Sue Neall, the expert whose wardrobe-in-a-weekend inspired these posts, could manage to sew those in a weekend, if it was her style. She chose a softer pattern which would not be quick and easy for many of us (Adri oop Vogue 2910). She was making a wardrobe for a week when she needed to look competent but friendly rather than authoritative and powerful. We slower sewers might pick three 1-hour patterns so we could cut and sew a capsule in a day. . . er. . .
There’s a good choice of jackets for a softer look. Perhaps a Butterick 4989 2 hour jacket, a camisole from the same pattern, and a pair of McCall’s 5889 1 hour pants. Or the timed wardrobe patterns are supposed to take less than 6 hours to sew a basic capsule. It would certainly be pressurised to sew one of these capsules in a day. Me, I prefer to stay calm. . . but it’s interesting and fun to think about the possibilities ! 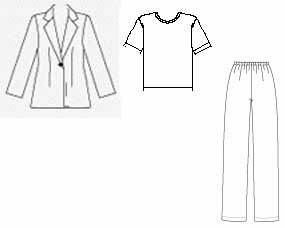 Kate Mathews in ‘Sewing a Travel Wardrobe’ suggests you make jacket, pants, dress and skirt from the same fabric, for easy co-ordination. She calls this a ‘Six yard wardrobe”. That would speed up cutting and sewing a bit more. Goodness, you might even have enough time to make one of the oop Butterick 5055 2 hour bags. . . This entry was posted on June 19, 2010 at 8:22 am and is filed under specific capsules, speedy sewing, wardrobe planning. You can subscribe via RSS 2.0 feed to this post's comments. Both comments and pings are currently closed. Heck, even I’m tired after reading all of that, and I have seriously contemplated sewing a wardrobe in a weekend. That sort of approach does suit some people’s lives though, even if its not for everyone. I just openly laughed at the 2-hour blazer. OK, you might finish it, but would you want to wear it? The cascade jackets are another matter – I zipped the seams of mine together in about 20 minutes, tops. I have only paused because I have work on and have not yet mastered the rolled hem on my serger. In their Jackets for Real People, Palmer and Alto review that 8-hour pattern (one of the all-time best-sellers for that pattern company) – quite interesting. Well done Elizabeth – and thanks for the useful comments. I’m not one for wearing structured jackets, but I must look at that book some time. – Waterfall front unlined jacket. – Simple shawl collar unlined jacket. – Front band unlined jacket. All of which have elements like those you have posted Lisanne, so I think it is entirely doable, and when I’m done with following your research I will actually have a weekend where I’ll do the sewing and report back. Thanks Ruth – get better quickly, and we’ll all look forward to hearing about your adventures ! There’s just one more post planned in this speedy sewing series, on some of the patterns available from independent designers. Congratulations for posting such a useful weblog. Your weblog isn’t only informative and also very artistic too. There normally are very couple of individuals who can write not so easy articles that creatively. Keep up the great work ! !